If you've ever sat in a stadium waiting for the game to begin, you've probably tried to remember exactly how many players will run out onto the field. There are nine and they each have their own position: first base, second base, shortstop, third base, left field, center field, right field, pitcher and catcher. The only exceptions to this rule are when the Major League Baseball's American League uses a designated hitter or DH to bat for the pitcher; and in some types of recreational leagues, a fourth outfielder is used. The three outfielders are about evenly spaced apart behind the infield, at varying depths depending on the situation. These players catch batted fly balls as well as field and return ground balls and line drives that make it through the infield. Outfielders are expected to back-up the infielders during plays at a base, in case a ball gets by an infielder. OFs are also expected to back one another up; and make a throw with both accuracy and velocity to the correct base or cut-off man. Covering first base, the first baseman catches balls thrown at him by other infielders for a put out. He also should be able to field his position, scooping up grounders hit at him and tagging first for an out. First basemen should also be alert, charging to field bunts, catching pop flies, and throwing to other bases to try to catch a lead runner whenever possible. The second baseman and the shortstop have the same basic responsibilities, which are to field batted balls and turn double plays. The second baseman covers second base on a double play when the ball is hit to the shortstop and vice versa. One of the two players should have the primary responsibility of covering second base on a stolen base attempt, with the other backing up the bag. Each player should act as a cut off man for balls hit to the outfield; the shortstop for balls hit to left field and the second baseman for balls hit to right field. The 3B, or third baseman, has the responsibility of fielding batted balls on the left side of the infield that are beyond the shortstop's range. Many times the third baseman will shade toward the third base line if he is playing next to a gifted defensive shortstop, and he needs to have a strong, accurate arm to throw across the diamond to first base. The third baseman also needs to be able to field bunts as well as throws to third base on stolen base attempts and force-out opportunities. Catchers catch pitches and block balls in the dirt, and then return the ball to the pitcher. When runners are on base, the catcher has to be mindful and throw to the appropriate base if a runner is stealing or gets too far of a lead off. Catchers should also know how to block the plate for close plays, ideally without getting hurt. Advanced catchers may have the increased responsibilities of calling pitches and aligning the infield based on situation. The pitcher delivers the ball to the plate to start every play, with the goal being to retire the batter by strike out, fly out or force out. Pitchers also need to be able to field their positions, catching pop flies and charging to field short dribblers or bunts. They also act as the back-up on plays at the plate, in case the ball gets by the catcher. 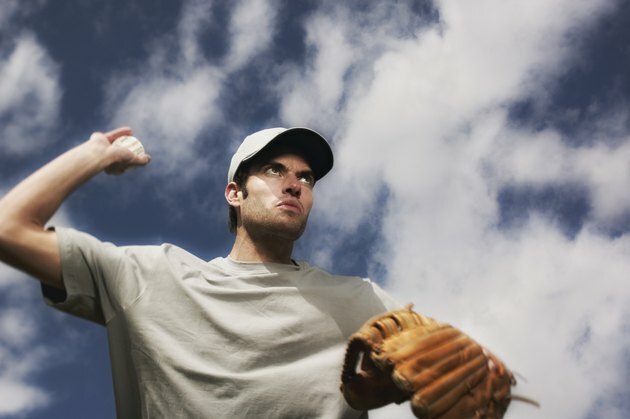 What Position Can Left-Handed Baseball Players Play? How Should I Field Weak Players in Slow-Pitch Softball? Can You Steal Bases in Softball?